At least 35 LGBT activists were detained on Sunday for attempting to hold a pride march in İstanbul’s famed Taksim square to mark one of the largest organized gay festivals in Turkey. 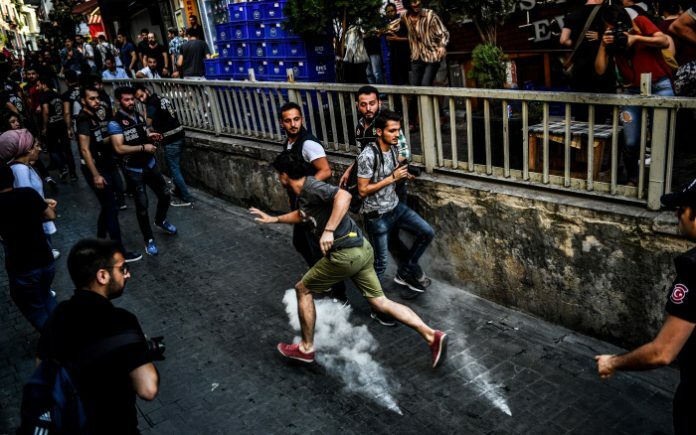 Turkish media outlets and several pro-LGBT twitter accounts reported that police fired plastic bullets at a group of around 40 activists and heavy police presence stopped people from entering Istiklal Street, where the rally was scheduled to start. The İstanbul Governor’s Office banned an LGBTI pride parade scheduled to take place in İstanbul’s famed Taksim street on July 1, citing security and public order concerns, the Turkish media reported. Despite the ban, the organizers of the event gathered in Taksim where thet released a public statement. “This march is organized in order to fight against the violence and discrimination fuelled by that governorship decision. We would like to inform the press and the public that we will go ahead with our prideful march with the same ambition as we had before,” the organizers of the parade said in a written statement on the Facebook page of Istanbul LGBTI+ Pride Week.